To purchase this book, you may click on the button above and you will be connected to Pay Pal where you can use your Pay Pal account or charge your purchase to your Visa or MasterCard. 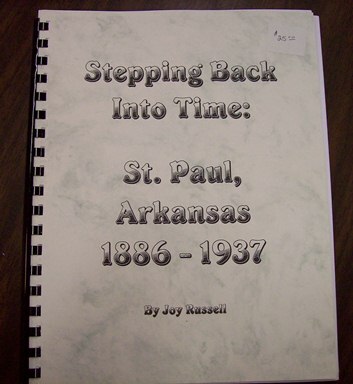 Or, you can send a check in the amount of $28.00 to the society requesting the St. Paul History. ". . . In 1898, Joseph F. McGalliard and his wife Mary, deeded two and a half acres to the White River Chappel Cimitery (sic) for the sum of one dollar paid. The cemetery is said to have been started with the first burial in 1886 when a man died on a wagon train passing through the area." " . . . became a merchant in the bustling new town of St. Paul with the advent of the railroad in 1887. He sold out just before WWI and moved to a farm at Hindsville. It was recounted by old timers that as the train pulled out for Fayetteville, Salyer waved a large leather money bag at his old cronies and told them it contained $40,000 . . . "
"E. F. Shinn, tall, lanky young printer from Ohio, was the founder of The Mountain Air, weekly newspaper published at St. Paul from 1888 until 1932. There had been a short-lived publication for a few months previously. Mr. Shinn generously proclaimed on the Airs's masthead, "It Blows for All!" and it did without fail for over sixty years." "Capital $15,000. Undivided profits $1500. C.M. Lawson, President; Wm. Charlesworth, V. Pres. T.J. Gilstrap, Cashier; W.C. Gilstrap, Sec'y B of D."